Buying a new car (or a new-to-you car) is both exciting and nerve-racking. The prospect of having a new car that you enjoy is great, but there are so many what-ifs that can make the process less than enjoyable. One of those what-ifs is getting an idea of what your trade-in might be worth. Your trusty old car, which may be only a year old, or may be over twenty, will inevitably be traded in when you’re hunting for a new car. But there are so many aspects to consider when evaluating it, such as mileage, accident history, and general depreciation, that you might be better off trying to sell your car privately and using that money as a down payment rather than trading it in. Thankfully, there are a number of sources on the Internet that can help make your decision a little easier. Here are a few that are highly respected. The Kelley Blue Book might be the definitive source for learning your car’s value. They go to many lengths to make sure that they correctly estimate the value of your car in any condition, and any added value from other additional amenities your car may have. KBB offers you both private party prices (that is, what to expect if you sell it yourself) and estimated trade-in value. The KBB has a database of which options come with which makes and models, and allows you to click to add any additional accessories or upgrades the car has. Many, if not most, dealerships use the KBB when determining the value of your trade-in. One local dealership is even offering up to 20% more than KBB’s suggested value. NADA doesn’t stand for “nothing;” it’s an acronym for National Automobile Dealers Association. In print since 1933, NADA Guides are an authority when it comes to determining the going price for your vehicle, whether you plan to trade it in or sell it privately. NADA takes data from a number of places to determine price, including a collection of documented transactions that involve each vehicle. When researching, NADA Guides will give you Rough, Average, and Clean (referring to the condition of the car) Trade-in costs, as well what the car may cost at retail. It also breaks down the worth of each accessory or option your car has. 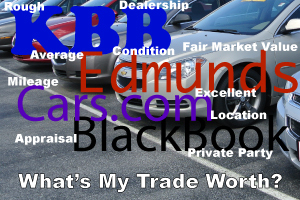 Founded in 1955, Black Book was created by three businessmen who frequently visited dealer-only auto auctions. To get better at buying and selling these cars, they realized that having accurate market value could save them (and earn them) some money. Today, they still attend auto auctions across the country, and determine current market price on vehicles based on the average of those auctions. Black Book is updated with new data every day, which ensures that you’re getting the most up-to-date cost of your car. Many dealerships use this pricing method to determine trade value because it shows them the lowest amount a vehicle can sell for, which is usually dealer auction price. Often hailed as the car authority, Edmunds, too, has a database that can help you price what your trade-in is potentially worth. With a complete list of options and accessories, as well as an option to choose its condition, Edmunds gives you a complete breakdown of your car’s worth, as well as the added worth of each piece of optional equipment. There are two key advantages to trading your vehicle instead of selling it. The first is the paperwork. The dealership will take care of all the paperwork, which can be somewhat involved and confusing. But if you’re comfortable with the system and taking the time to do it properly, this isn’t an issue. The second, and perhaps most compelling reason to trade rather than sell privately is the tax. If sell your car privately you are responsible for paying tax on the income generated from that sale. If you trade your car to a dealership, you don’t have to pay that tax. The income tax difference often makes up for or even surpasses the potential trade versus private seller gap in the value of your vehicle. It’s important to remember that any estimate you get from any of these sources may not be the amount you get offered by a dealership. While it may give you some negotiating room, the dealership will be able to provide you with the most complex evaluation of your car. Keep in mind that when you’re judging the condition of your car, you’re usually more likely to think it’s in better shape than it is. Take each price with a grain of salt, and use it to determine whether you should sell your car privately or trade it in. What tips do you have for getting the most cash for your old vehicle? Share them with us in the comments. Posted in Buying, Indianapolis, Shopping and tagged Automotive, Research, Trade, Value.